The basics of any businesses are to earn customers. Earning customers means to gain connection. Gaining connection means earn trust by delivering the reliable and desired service and/or products. In brief, “Customer service”, “Customer engagement”, or “Customer trust” are the mantras for any businesses you could name. Let’s understand the trending technology-blockchain’s role in enhancing customer service delivery. In this digital transformation era, the latest big buzzword that is captivating most of the forward- thinking organization is ‘Blockchain’. The businesses are undeniably recognizing the promising results a blockchain would deliver and are turning their digital journey towards it. Gartner predicts “The business value-add of blockchain will grow to slightly more than $176 billion by 2025, and then it will exceed $3.1 trillion by 2030”. Melanie Swan, the influential women in the blockchain, writes in her book “ Blockchain: Blueprint for a new economy” that it is the fifth computing prototype after the Internet, PCs, Mainframe, and Social media. Rightly, Blockchain’s potential is getting explored beyond financial transactions today. If your business thinks of processes to be followed in order to sell, market, or share information with the customers, then blockchain is indeed your techno-friend in this realm too. It provides the indisputable tracing of transactions. It records each step involved in customer interaction and acts as a truth recorder between both the parties. And also, it is not modified or deleted. Thus, the business personnel is able to pull up the data from a high volume of transmitted information anytime. This transparency of the blockchain technology is redefining the customer service delivery. We witness the influence of blockchain in each process of service delivery starting from the principles to design, develop, deploy, operate to the retirement of the services. Blockchain enhances the customer experience by making business more accountable and secure in every business and customer interactions. Let’s investigate further how this blockchain is beholding the tech-savvy and security-minded millennial customers. The transactions in business made through cryptocurrencies are immutable which readily eliminates the chargeback fraud. Moreover, there is no waiting period owing to third party-dependency and it involves low transaction cost. This blockchain feature attracts new clientele to participate in the business. It’s a well-known fact that IoT totally relies on the distributed client-server model. The use of blockchain secures this IoT ecosystem by facilitating the devices to form the group consensus and quarantine the unusual nodes. As the data is stored in multiple locations, it enhances availability, auditability, accountability, integrity, and, confidentiality. The use of private, permission-based blockchain makes each device accountable for the actions and is recommended for field services. In brief, when IoT is combined with Blockchain, it defines the process of how a customer pays and receives the product or the services. Blockchain facilitates the goods to get tracked all along the supply chain from the producer to the consumer. It releases the payments as each transaction in the chain gets verified. As the whole data is secured in the blockchain, the delivery status of a product remains transparent with increased visibility and helps the company to take up issues proactively. 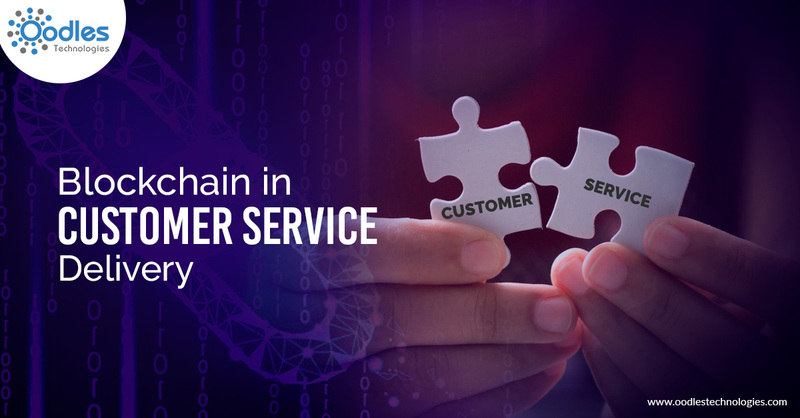 Thus, blockchain-facilitated supply chain process forms the strategic differentiator in customer service improvement by relieving the customers’ pain points. The exchange of digital assets done through smart contracts is facilitated by the blockchain. As the contractual obligations are tied to ‘If/Then model’, the contractual conditions of the business and the customer gets verified through the blockchain. The customer gets refund instantly if the service is not delivered on the specified time/date and vice versa, i.e., the payment is taken from the customer once service is delivered. Moreover, the transactions are verified publicly and all the involved parties are bound to contractual obligations. This strengthens the trust between the business and the customers. And, the companies gain a competitive advantage to stay in the business. The cyber threat is a nightmare when we are stepping into this digitally transforming era. The customers trust on the companies they would like to conduct business and share their information with them which invariably leads to identity theft risk. However, in blockchain-based record keeping, the data is secured through cryptography and is tamper-proof. In future, it is anticipated that the businesses may not have to store the customer information internally. Thus, there is no burden of storing the data safe and compliant. Blockchain technology is for the businesses which explores new ways to make business better for the customers. This technology explore varied opportunities to remove the existing liability issues of the business and make a fair deal in every processes to acquire and retain the customers.